If you’re thinking about remodeling your kitchen this spring or summer, you should definitely consider having hardwood flooring installed in your new space. Spring is finally here on the East Coast. Spring and Summer are the seasons when most homeowners choose to complete their home remodeling projects. The warm weather is much more accommodating for these projects than the cold! If you’re thinking about remodeling your kitchen this spring or summer, you should definitely consider having hardwood flooring installed in your new space. While you’re researching ideas for your new kitchen design, you will probably notice that hardwood is a popular choice. This is because it is extremely versatile and looks great with pretty much any design. This alone gives hardwood a huge advantage over other potential flooring types such as tile, linoleum, and vinyl. With the popularity of open concept designs, hardwood flooring is a clear choice. 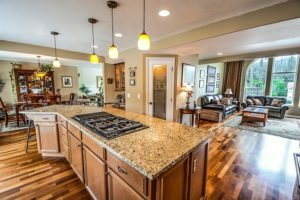 You can have matching flooring in your kitchen and surrounding rooms and your home will have a more uniform appearance, and you don’t have to worry about blending multiple different types of flooring. When hardwood flooring is appropriately maintained, it can last for many years. There are some homeowners who are reluctant to put hardwood in the kitchen because of the potential for moisture damage. Luckily, all you need to do is put down small rugs in areas where spills typically happen, such as in front of the sink and stove. Many homeowners opt to put anti-fatigue gel mats in these areas to add cushion and protect the flooring. Most types of flooring typically seen in kitchens can be very rigid. Tile, linoleum, and many types of laminate have little to no give in them. This is one area where hardwood flooring is particularly beneficial. Walking and standing on such hard, rigid surfaces for extended periods of time can cause you pain and soreness. Because hardwood naturally has some give in it, there is far less soreness involved. Different types of hardwood have different amounts of give, so talk to the experts at Jason Brown Wood Floors to find the type that fits your needs! Festool’s batteries are extremely versatile! Believe it or not, there are just FOUR different batteries needed to power all of those products! This is because they are interchangeable across different tools. As long as the voltage and power requirements match up, you’re good to go. This means you’ll have far less downtime while waiting for things to charge and you’ll be able to complete projects much faster! Keep up with us on Facebook, Twitter, Pinterest, Houzz, and YouTube and check out our blog for more news and information! This entry was posted on Friday, April 12th, 2019 at 2:31 pm. Both comments and pings are currently closed.